Manufacturer of a wide range of products which include bottom mould board plough, regular mouldboard plough and reversible mouldboard plough. We feel immensely pleased to offer an exclusive gamut of Bottom Mouldboard Plough. Our offered plough is manufactured by utilizing optimum quality raw materials and advanced technology by our skilled professionals. In order to ensure quality, the offered product is rigorously tested on various parameters. In tune with international standard, we provide the offered plough in various specifications, as per the requirement of our clients. Our valuable clients can avail this range from us at market leading prices. 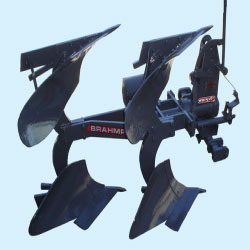 The BRAHMPURI Regular Mould Board PLOUGH can handle the toughest ploughing job with outstanding penetration performance. It is designed to work in all type of soil for basic function such as soil breaking, soil raising and soil turning. It can be used in stony & rooted soils. The under frame and unit-to-unit clearance are adequate to cope with trashy conditions. Adding an extra furrow or repositioning units to allow for extra clearance is quick and easy. 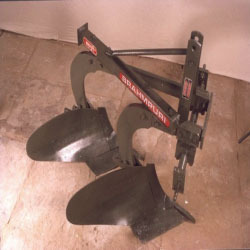 The plough has special wear-resistance steel bottoms with bar points for toughest ploughing jobs. Bar points bottoms ensure longer life as they can be extended or reserved or re-used till the last possible lenght. 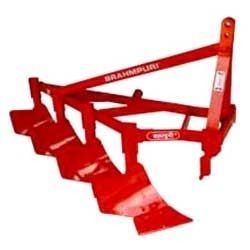 THE BRAHMPURI REVERSIBLE MB PLOUGH is a specially designed agricultural implement used for turning the soil levels upside down. Incorporating soil residues and making available more fertile layer for the new crop. It provides deep seed bed preparation with proper aeration and drainage. MB Plough is used as a primary tillage implement for soft and hard soils. Strong thick walled box Section frame. Body extension provision from 2-3 mould boards (pairs). Large inter body and under frame clearance. Specially heat treated parts and polished mould board. Strong thick walled box section frame provides solid base to the plough And Body frame can be extended to take another pair of ploughs. Enhances the scope of work for implement with higher HP tractor. Avoids blockages when ploughing in residue fields. Variable cutting width for different soil types. Avoids breakage of its parts in cloddy fields and prevents sticking of soil. Provision of changing alignment and prevent side dragging. Allows the possibility for changing curvature angle.